Suzy Bell, crítica de arte e colunista do jornal Cape Times entrevistou Jan Smith. Smith estava na África do Sul apresentando o seu trabalho na Galeria de Arte Contemporânea Erdmann e trabalhando com a Koeberg Alert Alliance. [Jan] I spend about 3-4 months per year in Mexico City, the rest of the time I am usually working on a story. Ironically, and perhaps to a fault, most of my personal work in Mexico is non-environmental. Instead I have focused on privately commissioned work for NGOs. [CT] Have remote and isolated modern-day ruins always fascinated you even as a child? If not, at what point in your life did this fascination take hold and why do you think it did at that specific time or was it a gradual, growing ‘fascination’/ area of concern? [Jan] In a geographic sense, remote and isolated imply a certain dose of adventure in the unveiling of a story, and I certainly find that alluring. This is very subjective interpretation however, and I am more interested in stories that are remote and isolated in the metaphorical sense. Remote because it is hard for us to understand them, and we therefore push them away from us, making them smaller on the horizon of our thoughts. Isolated because, regardless of their magnitude, they appear only occasionally, if at all, in our daily dialogue and memories. It is not every day we think of Chernobyl or Fukushima although the size of the events, both geographically and in terms of the impact on human life is enormous. [CT] How did you get involved with Koeberg Alliance? I know you are here as a guest of the Global conference questioning nuclear power in Africa this March, but did they approach you directly and invite you here? [Jan] I met Peter Becker, Chair of the Koeberg Alliance, at the Yokohama Conference for a Nuclear Power Free World, in January, where we were both speakers. We had an immediate corresponding interest in creating an informed dialogue on nuclear power on various levels. Art, and photography in particular have the ability to converse on many levels and help make a very complicated topic, more accessible. The Koeberg Alliance wanted to establish an art platform that complemented the conference. Peter also wanted a more intimate perspective into nuclear wasteland than what is usually offered in main-stream media, and he felt my work provides that. [CT] You were invited to speak at the conference for a Nuclear Power free world in Yokohama this year, with lessons from Chernobyl and Fukushima, are you often invited to talk? What was the response of artists to your work in Fukushima? Or the conference delegates? 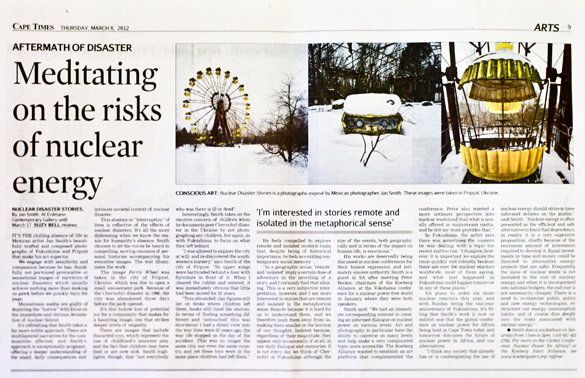 Did it result in any potential collaborations with other artists/photographers from Fukushima? [Jan] My speaking about nuclear energy is relatively new, if only because the issue of nuclear energy per se, has only returned to mainstream socio-political discourse after Fukushima. As we approach the symbolic one-year marker after the disaster, there are many more venues addressing the topic of nuclear energy, many of which are looking to establish a very early dialogue in the arts. This has certainly created an interest not only in my work, but that of others dealing with all things nuclear. The response has generally been very supportive. My work in Japan was only possible thanks to the help and unselfish cooperation of artists, journalists, photographers, academics, NGOs and dozens of private citizens. The list of collaborators is quite extensive. Of course detractors exist. In Fukushima, there was sometimes the concern that I am dealing with a topic that is still too recent and too raw. I disagree, however. It is important we explore the issue quickly and robustly because there are over 500 nuclear reactors world-wide, most of them aging, and what just happened in Fukushima could happen tomorrow in any of these places. [CT] Your strong stand against nuclear power is pretty self-evident through your art and text but specifically what is your comment on SA’s plans to order 6 more nuclear reactors this year? [Jan] I think any society that already has or is contemplating the use of nuclear energy should strive to have informed debates on the matter. Nuclear energy is often presented as the efficient and safe alternative to fossil fuel dependency. In reality, it is a very expensive proposition, chiefly because of the enormous amount of investment required to develop it. Equal investments in time and monies could be directed to alternative energy projects that are safer. Frequently, the issue of nuclear waste is not included in the cost of nuclear energy, and when it is incorporated into national budgets, the end cost is not necessarily cheaper. The discussion is not only about being pro or anti nuclear–that would dangerously pigeonhole the discussion. It is larger than that. It is about re-examining public policy and new energy technologies; re-structuring our energy consumption habits; and of course diving deeply into the risks associated with nuclear energy. The answers can be surprisingly simple and easy to act on. For example, on an individual basis, if we are more conscious and efficient in our consumption of energy, we reduce our dependence on both fossil fuels and nuclear energy. This can begin with small actions at home–turning-off lights we don’t use, for example. The pass-through and cumulative result of small personal changes in our behavior can have enormous positive effects regarding our adoption of safer and more sustainable energy generating technologies. [CT] There are many images that include discarded toys, which is naturally highly poignant with the loss of innocent play for children and the fact that the children may have died or are now ill and can no longer seek the comfort of their toys. But interestingly, you take the emotive concern to the toy’s point of view as in the toy’s being discarded and radioactive in the image you took of the Chernobyl disaster in the Ukraine. Why the empathy with the toys, am curious? It is novel and very Toy Storyesque but I know you are an artist most concerned with deeper meaning so what did I miss here you can kindly share thanks? [Jan] This is a complicated answer to give because it crosses many levels, and it is in itself the crux of that particular project, so pardon my lengthy response. “Igrushka” means toy in Russian, and it is also the name of the collection that has the portraits of toys. I used the toys for a variety of reasons, and I was not consciously aware of all these motivators at first. I developed the project over many weeks and visits to Pripyat, and therefore my feelings and motivation in the middle and latter days evolved and gained layers over my initial reactions. First off, the toys have to be put into a unique “archaeological” context. The inhabitants of Pripyat (the city that was evacuated after Chernobyl) left most of their personal belongings behind. Nonetheless, these items are all gone 25 years later. First, army decontamination crews removed them from apartments for burial. The little that remained was then looted, to the point that few things actually remain in homes. It is rare to find a book, or a piece of clothing or any sort of decortication or furniture. Schools are some of the very few places that offer any concentration of personal items, and even there, most schools are highly intervened. Visitors to Chernobyl are usually allowed to visit a handful a places under supervision and the combination of a limited access and 25 years of interference mean that is difficult to find something unique in the city. I was fortunate in this regard. I was allowed to explore the city at will, and re-discovered the south western nursery. It’s upper wings were barricaded behind a door with furniture in front of it. When I cleared the rubble and entered, it was immediately obvious that little had been moved over 25 years. Toys abounded; clay figures still lay on desks where children left them, books still lined the shelves. In terms of finding something different and “untouched” this was enormous! I had a direct view into the way lives were 25 years ago–they way life stopped on the day of the accident. This was no longer the same city, nor even the same country, and yet these toys were in the same place children had left them. I was very excited! I also became aware of a cruel irony: the only things that survived in the same place for 25 years were items that had little importance, and yet to have little importance means to be forgotten. Survival in exchange for anonymity. Nonetheless, for the children who played with them, these toys must have had an enormous sentimental value. Children care little for furniture, decoration or clothes, but toys are sacred. Had the children had the choice to take them away, I am sure they would have. The children didn’t have a choice, and adults placed toys on the bottom of the list of items to take in an evacuation. Over the years, it was adults who looted the city, and they had little interest in old toys. The toys survived because nobody cared about them, and the only people who did–children–were not there to defend them and take them home. Anthropomorphizing the toys was an easy next step. Most of us did this as children with our toys. We spoke to them, gave them names, and believed the toys had feelings and thoughts of their own. I see nothing strange or naive with being able to tap back into that as adults. To me, these toys were speaking and telling me a true story. In addition to casting light on Pripyat’s last days, they also offered insight into the games and customs of childhood in a Soviet culture. Their final position and arrangement in the classrooms told me volumes regarding how children played and what importance they gave to different toys, and therefore different values in Soviet and Ukrainian society. Once I had completed the toy portraits and began researching the fairy tales and fables they represented, I showed the images to Ukrainian adults who were children at the time of the accident. Spontaneously, they shared many discreet details of their lives. The toys triggered all sorts of memories, becoming conduits to personal experiences and the first memories regarding Chernobyl. In effect the toys progressed into a medium for accessing a collective past. I later realized that most audiences could also connect easily with the toys because we could relate to them–after all, a toy doll is a nearly universal item. It was only later that I saw how the toys , for some people–and only outside of Ukraine–were reminders of the “child victims” you describe. We’ve been conditioned by most media to associate these toys with dead or seriously ill child survivors–the infamous Chernobyl Children. I think we are biased in this regard. Despite the deaths and disease, most survivors of Chernobyl are healthy and productive. If the toys represent something at all, it is a loss of innocence in Pripyat, a last generation of Soviet children, and the irony of surviving intact in Pripyat for so long. I think this a fresh way of returning to the issue of Chernobyl 25 years later, and regard the transposition of empathy toward the toys as a valid means of accessing all of this. If you sense empathy for the toys, then I consider it a success, because it removes many rational defenses and allows us to connect with Chernobyl on a more sincere and common level. [CT] And in refugees from Pripyat you choose toys to symbolize the refugees, what made you choose more toy images, was it spontaneous or did it strike you immediately as being poignant and important to document it this way? [Jan] The toys are actually paired with memories from children outside of Pripyat. They are perhaps not direct survivors but witnesses to history and survivors by association. Second, the decision was spontaneous. On a guttural level it felt right to develop a “Toy Story”. I was aware of the clichés this could create, and I wasn’t exactly sure what to do at first, but I immediately I had something very special in front of me that deserved my attention. I spent nearly six months documenting, so the effect the toys had on me was profound. [CT] The accompanying text truly illuminates the images, did you do this research yourself interviewing people? Did you do lengthy one on one personal face-to-face interviews, or did you skin down the narrative in each case to highlight the most poignant comments? Did you do this via email and social media? [Jan] I interviewed over 200 people in all sorts of manners. I had many in-depth interviews that I latter filtered for pearls. Some required help with translation. Some were directly held in English, French or Spanish. As the project evolved I turned to email and social media. Igrushka had its own web site and social media pages, and I posted five questions that were relatively simple and fast to answer: How old were you? Where were you? What is your name? What was your favorite toy or memory at the time? What is your first memory of Chernobyl as a child? I also received many spontaneous emails, and many spontaneous answers from people who heard of the project through word of mouth. [CT] In a series of images, the theme of loss of schools/school children/family and infertility due to the radioactivity, was this your one of your key narrative layers of intention in documenting as you did? [Jan] Off hand I don’t recall making any references to infertility due to radioactivity, but the references to lost childhood and family are of course there. Asking people about their childhood in the context of Chernobyl sets the stage for feelings and associations of something lost, and I was conscious of this. I think is an almost inevitable result–intentional or not. I deliberately wanted to stay away from the well-versed angles of cancer, death and mutation. In limited doses, these approaches work, but too often they cause fatigue in the audience and among the protagonists. Furthermore, this is not the full story. Not everybody who was there is ill, or dead. What is true however is that for survivors and Ukrainians in general, collectively something was indeed lost. Children then lived in a different reality–a Soviet reality. Chernobyl helped put an end to that time and ushered in a period of turbulent change and instability. I wanted to address this, and in that regard, inserting, or relying on a sense of loss in my line of questioning was intentional. [CT] The melancholy mood of the interruption of lives in your Fukushima images are truly evocative. It must have been most overwhelming documenting these images, how did you cope doing this? How much time did you spend in Fukushima and how soon after the nuclear disaster / tsunami? And isn’t your safety endangered in taking these images? Or do you dress in protective gear? [Jan] I took the last of my Fukushima pictures on the 22nd of February. Most were taken a week earlier. This is all very, very recent, and I entered the evacuation zones illegally to acquire many of the images. All in all I spent about 10 days in the Fukushima area this year, another two weeks in the tsunami affected areas further north, and four more weeks working in Tokyo. My accumulated dose of radiation is roughly equivalent to two mammograms. Risk to myself at those levels is relatively low. Using the mammogram as an example, it is a safer to be exposed to radiation in order to find breast cancer than not to have a check-up. Could a mammogram cause cancer? Perhaps, but it is extremely unlikely. This does not mean these areas are safe! Living there for a year is equivalent nearly 70 mammograms. At that rate of exposure to radiation, the chances of one’s health being affected rises. I knew the general I was being exposed to and therefore did not consider it necessary to wear any protective clothing. In reality, the infamous white suits offer little protection against the worst types of radiation. Less dangerous types of radiation are effectively blocked by our skin and clothes. I am not dismissing protective suits entirely however. They certainly reduce the possibility of exporting radioactive particles that could later potentially be ingested and remain in the body or contaminate an otherwise clean area. I certainly feel strong empathy for the interrupted lives—indeed that is what motivates me to explore and showcase this story. Rather than overcome me it actually pushes me forward, and if I didn’t feel deep empathy I think I would fail in telling this story. I feel responsible for telling stories in a way that lingers in people’s mind without resorting to shock tactics. Despite this, I must admit that on this occasion I was a bit distracted with the worry of being arrested. [CT] I like that the way in which you documented the Japanese doll festival was most unsentimental in not including portraits of the people but focusing on the inanimate objects that for the community hold such spiritual hope and power. Did you experiment doing both then discard portraits to focus on the poignancy of the dolls themselves or was your creative instinct to do this from the beginning? If you did choose not to use portraits with the dolls, what made you decide to do this? To show a new more subtle poignant less emotional/sentimental focus compared to the brash media’s style of documentation/sensationalism? [Jan] Thank you. The doll portraits are actually some of my favorites. In practical terms I had nobody whose portrait I could take. The owners of the homes where I found the dolls were evacuated. Yet, if I had the choice, I would not choose to take portraits of the people–precisely because inanimate objects can envelop such power and communicate so much. I think the dolls in particular prove this point. After my first encounter with the dolls I realized they were there for something other than one owner’s personal preference or collection. Furthermore, the way they were laid-out made it evident there was a symbolism to them. I didn’t know what it meant at the time, but I could grasp that I was seeing something special. It was only later, back in Tokyo that I learned what the dolls meant. I also learned that the doll ceremony is usually held the first week of March. So in this sense, an inanimate object provided many clues, even to the point of surrendering a date. They also held sufficient power to be recognized as special–even to an outsider–although the particularities of “why” were not originally known to me. I agree that portraits would perhaps be a more brash…or frontal? Way of exploring the topic. I generally find that approach unappealing because (at least to me) it leaves less room for visual exploration. The facts are quickly communicated; my mind understands it and wants to move on. As a viewer I enjoy a subtle rapture with an image. It teases, it haunts, it invites me to learn more, to understand it. I think this is the allure of being subtle. I think I often fail, but I do try to be softer. When one succeeds, I think the result can actually be very emotional (without being syrupy) but in an honest and unadorned way that is stronger precisely because it is understated. [CT] Absence of people in your images is reflective of the after-effects of nuclear disasters and it is truly chilling when we know what the reason is for their absence. When you set out to document was it clear in your mind that this absence was crucial as you were reflecting the reality of this absence? Were you ever tempted to document portraits of ‘survivors’ or did that feel distasteful for you from the start due to the mainstream media’s vulgar manner in doing just this and being highly sensational and alarmist and not going deeper into the communities less visible/less obvious concerns. Is that why you chose instead to record their stories / comments voices/personal histories instead? [Jan] My interviews with evacuees and former residents were mostly outside of the zone. It was a bit bizarre at times. For example, I would be given instructions about where to go and how to get there, but then travelled alone or with only another photographer. I would then come back and begin to understand what I saw through a new set of interviews. Occasionally, I would be escorted into the zone with a former resident for a few hours. Nobody lives there. When that happened, they saw themselves as ambassadors of their communities and were keen in answering my questions about the place. Personal anecdotes would of course emerge, but are mutual purpose was to tell a story that rose above individuality. In this sense, I did feel it “vulgar” to use personal portraits to advance or help tell the story. It felt like cheating. And it also seemed a bit rude to choose one person’s face as emblematic of an entire town. Ironically they would sometimes ask to have our picture taken together, but that is a private. [CT] The entire destruction or elimination of normal everyday life is inconceivable, when you met the community and spoke to them was there a common thread of response in expressing their loss? A common theme of concern? [Jan] This is an interesting question because thinking back there were many different responses. Most of the evacuees I spoke to, or with whom I travelled into the zone with, were men. The women and children stayed away or had evacuated to Tokyo or further south. In contrast, in Tokyo I spoke to many more women, who conversely, had their husbands or brothers or sons still working near the exclusion zones. The women were generally younger than the men. In hindsight I realize each gender expressed and worried about different things. The men, in almost stereotypical Japanese fashion were more stoic, and often communicated using silence and discreet posture. They spoke of the land, history, and alluded to their own awareness at being forgotten. They seemed to accept their fate and were focused on reconciling loss with the pragmatic needs of building a new life. The women more readily expressed their anger and were more critical of the situation. They spoke more about people and anecdotes. The evacuees from most towns generally agreed that the situation was not solvable in their lifetime, and did not believe the government. One exception to this was the city of Minamisoma. Minamisoma had about 60,000 residents and is now intersected by the evacuation zone. Half the city is restricted and the other half is open, but quite empty. The town folk from Minamisoma are more stubborn in wanting to rebuild, decontaminate and return to their homes. I got the impression they resented me, as if I was rudely underestimating their capacity to solve the problem. I think this was partially due to economics. Minamisoma was a comparatively large city and rebuilding the city could restore a lot to the local economy. Towns such as Namie and Itate were smaller, had an older population, and were more rural. In some ways they were already fading. [CT] In raising awareness about the destruction of humanity and the environment through nuclear disasters do you feel you tread a wafer-thin line of being an eco-activist and an artist or do you consider yourself most definitely playing the role of both and perhaps feel the more socially-politically active the artist the more arresting and significant the art? [Jan] I have never considered my work as activist but can appreciate how it can help activist movements. This is very different from creating work with the support of a particular cause already in mind. I don’t think art needs to be activist or opinionated to gain significance, but it is rewarding when other people find meaning in my work. Such interpretation may emerge in ways that I did not originally imagine, but if the cause makes sense and I agree with it, I have no problem lending my art to promote the cause. [CT] May I ask who funds you to go to the sites of these catastrophic effects of nuclear disasters, or are you self-funded? [Jan] I’m mostly self-funded. I recover my investments through gallery sales and the sale of my work to select publications. [CT] Tell me a little bit about Still, the organization you co-founded? [Jan] It was an organization designed to help photographers based in Mexico to grow and gain exposure in the Mexican market. (they do not need to be Mexican) I founded it with two other photographers in early 2008. We choose an annual theme to exhibit and invite emerging photographers to work and exhibit with us. The exhibits usually start in Mexico City and then travel around the country. We are still very small, but have opted on working closely with a few people at a time. [CT] Are you an active member of any anti-nuclear organizations? Which one/one’s? [Jan] I am a member of the Atomic Photographers Guild.